It’s wintry cold and you want something warm and cozy to eat ASAP. You also want to stick to your nutrition goals. What do you do? Pull out your Instant Pot and make paleo chicken soup with kale! This is a recipe for exactly what you need – a delicious comfort soup that is loaded with flavor and nutrients! 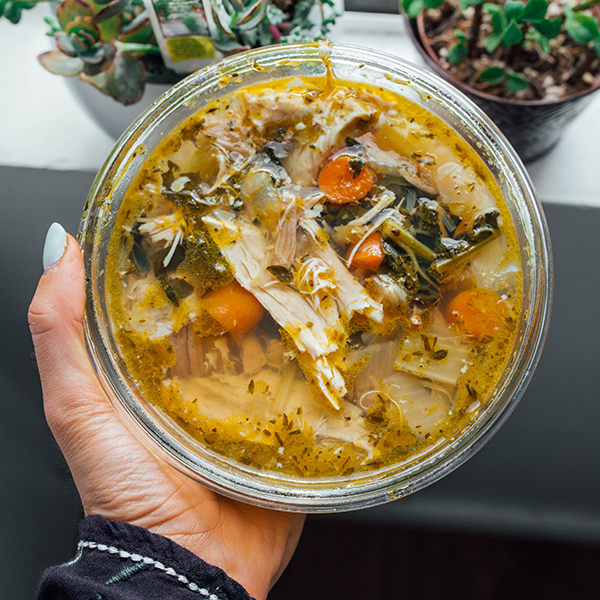 What makes this paleo chicken soup even better is the addition of kale that adds another layer of flavor and nutrition and will have you reaching over for seconds. This may just be your new favorite soup for the colder months. Over the years kale has grown in popularity and for very good reasons. Often called a “superfood,” kale will pack a nutrient punch whenever you include it in your diet. It has high levels of many vitamins and minerals, which are essential for normal body function. The nutrients in a serving of kale will support your immune system, brain, eyes, skin, muscles, heart, and many other pathways within your body. Kale has anti-inflammatory and antioxidant properties, making it helpful for preventing and fighting many diseases including heart disease and cancer. It’s also an iron-containing food, important for you vegetarians and vegans out there. The nutrient counts will be decreased some in cooking, but it’s still worthwhile to include kale and other leafy greens in meals regularly. Using your Instant Pot, hit the saute button and add the veggies, seasoning and avocado oil. Turn off the saute feature, add the chicken, 4 cups of chicken broth and 4 cups of water. Remove the chicken from the soup, add the meat back in.